Superhero Mascara Travel Size Confetti Popper is rated 4.1 out of 5 by 856. Now available in a festive confetti popper for the holidays, your Superhero Mascara Travel Size contains the gift of Superhero lashes! Developed with plastic surgeons, this game-changing mascara is infused with proprietary Elastic Stretch Technology and stretches the look of your eyelashes wider and longer while wrapping eyelashes in a volume-boosting, lengthening, ultra-conditioning black cape of power and color for clinically tested results. Powerful anti-aging ingredients including collagen and peptides, plus Super Black pigment combined with the Lash-Changing Power Brush work together to coat eyelashes from base to tips—lifting while separating them to create the look of a fuller lash line. The super-buildable formula literally takes your lashes to new heights and puts lash power at your fingertips. This limited-edition confetti popper also features a decorative hang string, turning it into the perfect holiday ornament! 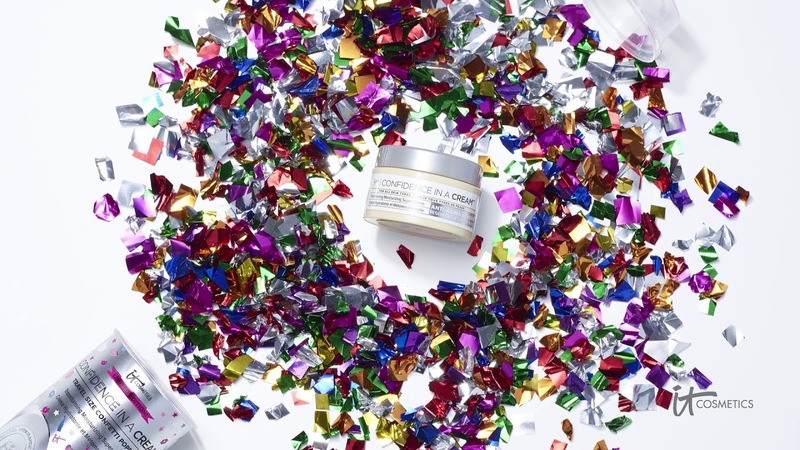 Festive confetti popper contains travel-size Superhero Mascara for the gift of Superhero lashes! To open confetti popper, aim away from face and gently push stick upward. Product will pop up with confetti. To use Superhero Mascara, start at the base of your eyelashes and wiggle and sweep up and through to the tips. Apply additional coats for more dramatic results. Rated 3 out of 5 by Ssteel8880 from Love hate relationship I really have mixed emotions about this. It makes my lashes look great but its just a gloppy, flaky mess. Rated 5 out of 5 by Bobs from New favorite I received this mascara in my Boxycharm and I just can’t say enough about how much I love this stuff. It is by far my new favorite. It surpasses all other mascaras I have ever used. My lashes are short and light so naturally I have to use several coats of whatever mascara I use. With this mascara I only have to use 2 and could even get away with one for days when I want a more subtle look. Rated 1 out of 5 by Ferna from Horrible! Clumpy! So Disappointed!! I have this mascara 1 star because I couldn’t give it zero. I never do reviews but this had to be said... Based off of the price, I thought for sure it would be amazing. I was soooo wrong. I e been using mascara for a very long time and this is by far the worst I’ve ever used. It’s so clumpy the second it’s applied. Ladies, do yourselves a favor.... DO NOT BUY. Rated 5 out of 5 by ams60 from Best mascara ever!!! This is literally the best mascara I've ever used, and in 58 years, I've used a lot!!! Eyelashes look long and full!!! Is this mascara 100% plant-based(vegan)? Is there an expiration date on the Superhero mascara? I curl my lashes before I use this and it never stays. Any tips to help keep the curl? I have sensitive very dry eyes! Is your mascara considered hypoallergenic? Would you recommend this mascara for super sensitive eyes?? It is also important it comes off easy with water alone. what's the story as far a for sensitive eyes? Is it fragranced? Hi there! Thank you for reaching out to us, we are happy to assist you further with any questions you may have with Superhero Mascara! We ask that you please contact us directly for further assistance. We invite you to Live Chat with us at itcosmetics.com! We are available on Live Chat Monday-Thursday 8am-7pm and Friday-Saturday 9am-5pm EST. We look forward to speaking with you! XOXO Tina. Seems like IT comes out with 2 or 3 versions of a moisturizer which adds confusion for many because they don't know which line to go for. But I, among many, have requested for years to release Waterproof Superhero Mascara, when will that be in the making? Hi there! Thank you for reaching out to us. Please know, we take in all feedback from our IT Girls, and Guys whether IT be positive or negative. We love hearing which products are important to you, and new ideas that you're looking to see. We can assure you we will pass your feedback along regarding Superhero Mascara in a waterproof formula! We hope this helps. XOXO Tina. Hi there! Thank you for your question. At this time Superhero&trade; Mascara is not formulated to be waterproof. However, we are happy to pass along your inquiry regarding a waterproof version to our teams internally. Make IT a beautiful day! XOXO Tina. Exciting news, IT Girl! This Limited Edition Holiday Product will be available for you to purchase very soon. Enter your email address to be the first to hear about IT!